This two-part post is intended to inspire graduate students who are currently not saving for retirement to start. The graduate students I refer to in this post are those who are being paid a living wage while in school – that is, they are not taking out loans for tuition or living expenses and can keep their must-have living expenses (rent, utilities, food, etc.) to around half their net income. Others who are not currently saving for retirement, because of a low income or other reason, may also find these posts motivating. I think that people in significant amount of debt, particularly high-interest debt, should prioritize paying that off before saving much for retirement, so just apply the rationale for saving for retirement to aggressively paying down debt if you are in that situation. Please remember that I am not a financial planner or CPA and you should not consider my opinions financial advice targeted for your situation. In today’s post I will present one long argument why graduate students should save for retirement and in Friday’s post I will present three short arguments. I hope that anyone reading PF blogs would know what compound interest is, but just in case you don’t: compound interest, when you harness it to work in your favor, is truly awesome. The money you invest earns a certain rate of return, which is added to the balance. Then that larger balance earns a rate of return and grows even larger. And even larger, and on and on. Sounds good so far, but let’s look at a simple example that will blow your mind. Let’s take $5,000 and invest it in a vehicle that provides 8% in interest, compounded monthly. (I used this calculator.) You can see that as the decades go by, this investment grows to crazy high balances! And they accelerate in their crazy-high-ness the longer you leave it compounding. The power of compound interest clearly lies in the length of time you allow the investment to grow. So by choosing to start investing for retirement while in graduate school, I’m gaining 5+ years worth of investing time. How much would that be worth? Let’s say “Jamie” starts her PhD at age 22 and graduates at age 27 (don’t we all wish we were like Jamie!). Her stipend is $24,000 per year and she saves 10% into a retirement account in which her money grows tax-free earning a 10% return. (Since she’s largely or completely invested in the stock market, she’s garnering returns, not interest, but we estimate them the same way.) At age 27, when she starts her first “real job,” her retirement account balance is $15,616.48 (she put in $12,000). If Jamie continues to earn a 10% return on that money (generally accepted as the historic rate of return in the stock market) until age 65, the balance from just the $12,000 she invested during graduate school will grow to $687,169.41 (or $221,538.96 after taking estimated 3% inflation into account). That is not chump change by any means and will likely be a significant fraction of her total retirement savings. That’s money that she would not have had if she had chose to put off investing. Of course, it is possible to make up for lost time (though not easy). If you expect to make a lot lot more money post-graduation than during graduate school, you could choose to add $16,000 to what you would have saved anyway for retirement in your first year after graduation. That would make up for the lost time, although it would cost you an extra $4,000. But do you really think you will have the discipline to do that? And don’t forget, there are limits to the amount of money you can put into tax-advantaged accounts in a given year (for example, $17,000 into a 401(k) and $5,000 into an IRA in 2012). If you’re making such a ridiculous amount of money after graduating you’ll probably want to max out those accounts anyway and you will pine after those years in which you didn’t contribute anything to the tax-advantaged accounts available to you. For further reading on the power of compound interest, see articles in Kiplinger, Mind Your Finances, Get Rich Slowly, and My Money Design. The compound interest argument alone is enough to convince me to start saving for retirement. Mathematically, I want that additional time and access to tax-advantaged accounts. But perhaps it’s not enough to convince you, which is why I have three “softer” arguments as well coming up on Friday. Were you convinced to save for retirement by reading descriptions of compound interest? 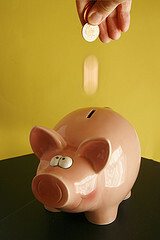 Do you still put off saving despite knowing the time cost? Post script: The examples I have used here are very typical for illustrating the power of compound interest. However, they are unrealistic as predictors for retirement balances for a couple reasons. 1) There is no guarantee of a consistent return or that the future stock market will behave like it has in the past – if you even accept the 10% rate of return figure. It will be a bumpy ride and may disappoint. 2) It would be very unusual for someone to stay 100% invested in the stock market right up until retirement. Standard asset allocation advice would move a greater and greater percentage of the portfolio into lower-risk investment vehicles such as bonds, which would likely provide a lower rate of return. Keep this in mind when you read posts promoting the power of compound interest. 54 Responses to "Why You Should Save for Retirement While In Graduate School Part 1"
I definitely agree with this…every little bit will be more later. That is really, really all there is to it. At the same time, I think maybe we can cut ourselves a little slack about saving the recommended proportion. For example, my very basic costs of rent, food, etc. take up about 2/3 of my income. Is it responsible to be saving, say, 7% for retirement in that case, or is it kinda pathetic because if it’s not 15%, you are bad at saving? On the other hand, if we don’t really start our careers until around 30, I think the expectation shouldn’t be that we plan to only work for another 30 or so years…so hopefully we can make up for lost time. As I said at the start of the post, if you cannot reasonably keep your must-have expenses to half your net income, you’re not being paid a living wage. From your other comments I know you’re trying hard to keep expenses down so I think you’re plain just not being paid enough. Anything you can put away for retirement now is awesome/bonus, and I don’t think you should push yourself to meet minimums that are meant for people being paid enough. So I think you’re doing great! I’ll go into this more in my next post, but I don’t accept the I’ll-just-work-longer argument (again, because we’re paid a living wage). I’d rather give myself the option of stopping work at 65ish by saving now than force myself to work longer by putting it off – especially because we don’t have complete control over when we retire. We have a family member who was forced into retirement earlier than expected because of a health condition, for instance. I need to start putting more money into my retirement account. I’m well into my 20’s now so it’s not like I’m getting any younger, and I need to make sure I have a nice amount for retirement . No time like the present! When I went from 10% to 15% it was a big leap and I wasn’t sure how the budget would work out, but it went fine and we adjusted. If I only had the discipline to have saved when I was working through high school. It is tough being that young and dumb with money. Good post on the importance of saving early and often..it can have big impacts later in life even just tossing a few bucks in there. I don’t mind that I didn’t save before I had my first full-time job. It would be nice to have that extra cushion, but since I was dependent on my parents I don’t think that would have been really fair to them. One of my friends who is in grad school is only saving for a house right now and putting away nothing for retirement, which scares me. Her and her husband are getting close to 30 and going to have kids soon and will pay cash for a house, but they don’t have a cent saved for retirement. She’s pretty smart, so I’m sure there is a logical reason, but I don’t completely understand why they’re not just putting away a small amount for retirement now. Leigh recently posted..Am I Being Frugal Enough with my Housing Choices? Oh no, being scared of the stock market is a really bad sign! They need to learn about compound interest vs. inflation! The stock market is the only game in town for very long-term savings. They’ve heard too many stories of people losing their entire retirement savings in the stock market. 🙁 They do understand compound interest though. Do you have any suggestions for how I could help them? I dunno, don’t you think those stories are almost all exaggerations? Or they “lost it all” because they did something misguided like hand-picking only a few stocks to invest in (or only in the company they work for) or selling at the bottom? I mean, yes, we’ve gone through a really rough few years with the markets BUT the chief losers are those who got out at the bottom. If they just stuck in for a few years everything recovered. That’s a hard situation for people who are really close to retirement or living off their returns but not really a concern for young people. And that’s why they should follow some kind of asset allocation plan so that they have less and less of their portfolio directly exposed to the market as they get closer to retirement. It is certainly possible for people to retire without being in the stock market, but they have to look into other more secure investment vehicles and save WAY more to combat inflation. Having a paid-for house is a great start but you still have to eat and pay property taxes. I wonder if they could run through an exercise of how much they should be saving from now on if they want to live off their savings accounts in 35 years for 30 years? Leaving out inflation, they would have to save about 50%, right? Plus inflation and a paid-for house and I bet it would still be about 50%. I definitely think that those stories are almost all exaggerations. If you were about to retire, you shouldn’t have had very much of your portfolio in the stock market, at the very very most 50%. So when the stock market dropped 50%, you would have only lost 25% of your portfolio. The way I look at it is that the money I’m putting into retirement investing is money I don’t need for the next 10 years since I have 6 months of emergency reserves and a pretty stable job. They seem to think that they need ALL of their money NOW. I was also trying to explain to her why putting all of their money into the house to pay it off as quickly as possible and ignoring retirement isn’t the smartest way either… I think my logic on that is that doing things individually means that nothing really sees the power of compound interest and that so long as your mortgage payments are within your monthly cash flow, using that small leverage to invest for retirement and take advantage of the compounded returns in that is important. Having a paid off house will help your monthly cash flow, but not help fund your retirement. Once you put money into the house, you can’t get it back out. It’s a really tough problem. I am in the midst of a similar one with my parents. I’m trying to motivate them to pay down debt so they can prepare for retirement. I think their retirement accounts are underfunded, but my mom doesn’t acknowledge how fast they are going to run through the money and my dad says he’s never going to stop working. It’s hard to accept that you can’t control what other people do no matter how noble and well-informed your intentions. I don’t know if there’s much you can do until they start caring on their own about these matters and start doing research. I feel this way about a lot of important areas of my life – personal finance, getting to a healthy weight, and Christianity. I want to evangelize everyone in all these subjects but I know that I didn’t come to my enthusiasm in these areas because anyone else shoved them on me – I developed it on my own and then sought out my own sources of learning. So I probe and suggest and try to portray myself as perhaps a knowledgable source, but largely just sit back and wait until they light their own fires and hopefully will come to me for reference then. It’s worked to varying extents with a few friends, but certainly not as many as I’d like. Thanks for the referral Emily! Nice job describing the benefits of compound interest! At work, I often council the new employees about our 401k plans and I am shocked about how many people don’t understand how this concept will benefit them. As I show in my example, you have the potential to generate more wealth from your earnings than you would from just your regular principal. It really is the most form of putting your money to work for you. Basically, the great thing about compound interest is that it is a strategy you can use to get rich without knowing anything about investing; you could just simply invest in an Index Fund. It just takes time! So the sooner you start, the better your chances will be. Thanks! I love index funds. 🙂 I love how accessible investing is now and that I don’t have to know much to make good decisions. I see some benefits to prioritizing an all-cash home purchase over saving for retirement. More income freed up to invest because they won’t have a large chunk of it commited to mortgage payments. Save thousands on interest over time (which can be invested). Reduced risk because they can never be underwater on their house. And remember, a house, like mutual funds or stocks, is an investment which traditionally appreciates in value. It is another form of investing. I agree that a home purchase is a good investment as well, although I don’t prefer it over a largely-stock retirement account in terms of a return on investment, especially with interest rates so low right now. Paying cash for a house is awesome, but how long would it take to save up all the money? To buy a starter house in Durham would take nearly all of my income over 4-6 years of my PhD, which is obviously infeasible and I would lose a lot of that valuable investing time. A Roth IRA or similar retirement account is much more accessible as there are accounts with low minimum monthly contributions available. Plus, if we’re talking about graduate students, how many are interested in a long-term real estate investment in the city in which they attend school? Most will move away after graduation, and selling a house only a few years after buying does not guarantee a profit from the sale. Keep in mind also that up to $10,000 of a Roth IRA can be withdrawn penalty-free to use toward the purchase of a first home so some will use it as a dual-purpose account. As for me and Kyle personally, we have chosen to save aggressively for retirement now and wait to start saving for our first home purchase until after we get real jobs. We would rather put the small amount of money we can save now into an account garnering big returns instead of into a savings account or CD, which we would still have to supplement for that home purchase after graduating because there wouldn’t be enough money yet! We also aren’t going to buy right away once we move even if it’s directly to CA because we want to rent for a while to study the market before buying. I think for someone with substantial retirement savings already, paying down a mortgage aggressively or buying a house in cash is an asset in diversifying one’s investments. It’s just not something I think is a good idea early on when one’s income is only a small fraction of the purchase price of a home. I’m not saying that is the best plan, just that it is not crazy. If I was a graduate student deciding where to invest, I would probably fund a Roth IRA first, then save whatever else I could to make as large a down payment as possible. It certainly does not make since to me to buy a house while in graduate school if planning to move afterward. I agree it’s something to consider. I know a few people who bought townhouses when they started their PhDs, knowing they would be in the area 5-6 years. I don’t think they’ll make any money on the sale given the timing (2008), but it will probably still beat renting over that period. I like your priorities of maxing out a Roth and then saving a lot for a down payment (20%!). Unfortunately we can’t even max out our Roths so we’re not to the second step yet! I love that you are saying that graduate students should save, if they are earning income. Before I got into the Master’s (which I have to pay for), my husband was saving 15% of his salary (from being a PhD student). This also helped us when I went back to school and we need to pay for classes, since there are no longer subsidized loans for graduate students. One thing that can also keep graduate students, if they do not have enough saved, is a Fidelity AMEX. We get 2% back that goes straight into my husband’s Roth. This only works because we have more than the minimum required in the Roth, though ($2000). Hm, I’ve never heard of that product. I used to have Fidelity but all our investments are with Vanguard now. That’s a great savings rate for a PhD student! Did that go into cash/accessible funds for your grad school or was that into retirement accounts? The 15% went into our Roth IRAs. We hustled for any money in our EF. For example, check out if anyone is doing human research studies. The going rate in $10 in my area for non-invasive studies. Given that those people were right down the hall, we just would wander over. Normally he and I would make about $10/each/month to put in our EF. Ginger recently posted..Grocery update: I am almost there! I used to do studies a lot when I was at the NIH but no so much at my current university. It’s easy money for sure! I’m mulling a question, with background in 2nd paragraph: would it be better after paying off unsubsidized student loans to maintain those payments to interest deferred loans and get debt free ~16 months after unsub payoff, leaving me with about a year to save before graduation (hopefully! ), or put the $16,500 owned into an account that potentially has higher than 4.5% growth and could offset the interest growth? Good for you for getting a fellowship and deciding to use grad school to boost your debt payoff or savings! You have 13k$ in unsubsidized student loans at 6.8% and 16.5k$ in subsidized student loans at about 4.5%, both currently deferred. You make 30.5k$ of unearned income (so no access to tax-advantaged retirement funds). You keep a $2k emergency fund. Your question is whether to prioritize paying off loans (perhaps subsidized and unsubsidized being treated differently) or investing. As I’m sure you’ve read, people have different opinions on debt repayment vs. investing and ultimately it comes down to your individual tolerance of debt and risk. I think a helpful line of questioning is “Would you borrow money at 6.8%/4.5%/0% to invest it at an unknown rate of return?” (Keep in mind that your rate of return will be damped by taxes since you have to invest in a taxable account.) Even though the stock market has been going like gangbusters in the past few years, investing is not without risk. Do you have a plan to beat 6.8%/4.5%/0% (after taxes) in other investments and how confident are you that you will succeed? And (importantly) is it something you want to take time to develop and monitor while you are in school? Perhaps the guaranteed rate of return of 6.8% is attractive, or the guarantee of never paying interest on your subsidized loans if you finish saving for them before graduation. Further, is your plan to invest the money you save for the long-term and pay off your loans once they come due out of your cash flow or is it to invest this money and then withdraw it all when your loans are due to pay them off (using the account as a high risk/higher reward savings vehicle)? If the latter, you have a short time horizon and likely won’t want to invest aggressively so that you can protect your principal. I can give you a personal answer from what I did in a similar situation, though at the time I made the decision I did not run the numbers and didn’t know as much about investing as I do now. I paid off my unsubsidized student loan (6.8%) as soon as I could even though it was deferred because I didn’t like the idea of paying interest. I then chose to prioritize investing over paying off my subsidized loans (about 17k$) up to 10% – BUT I had access to a tax-advantaged retirement account. When my husband and I had enough savings to pay off the remaining loans entirely (while still saving for retirement at > 10%), we invested the lump sum in a mix of aggressive and conservative funds (3 year time horizon) in a taxable account, which we plan to cash out upon my graduation to pay off the loans before paying any interest on them. Basically, we borrowed at 0% to invest at . We decided that the experience of investing was worth more than a possible negative return because we had other savings by then. Our account balances went into the red almost immediately so we were certainly tested, but we found that we could tolerate the volatility. Again, this is a personal decision based on your risk tolerance and comfort with debt. Other things you should consider when making this decision: Is $2k in your EF enough for all of grad school? Do you have other savings goals such as for travel or a car? Will you have the fellowhips/1009MISC pay for all of grad school or only the first few years? Is your 1099MISC pay continuous or will you have internships/RA positions that will give you W-2 pay? (Perhaps prioritize debt payoff when you don’t have access to an IRA and retirement savings when you do have access?) How would you feel if you saved enough to pay off your loans but because of a bad investment you lost some principal and have to pay interest on even the subsidized ones? How much money do you want to have in liquid savings when you graduate to move in case you have to food your own moving bill? Regarding your girlfriend’s finances, I recommend that you do what’s best for you and she does what’s best for her until you have concrete plans to join lives and finances (in marriage IMO). Don’t count your chickens until they’ve hatched, so to speak. It’s tricky business allocating savings on a low income, especially with career uncertainty. Since I don’t know how long it will take to find a job after my PhD and how good the public transportation will be in the city I take a job in, I am hesitant not to have plenty set aside for unemployment and a car. So far I have only 0.15 years’ income in my IRA. Very good point. You definitely need to take care of your unemployment and a little savings for transportation first. In my observation, most people stay in their PhD labs until they move to their postdoc labs/real jobs, though. Or else take off for a round-the-world trip! What’s your transition plan? I started saving for retirement for the first time when I was a senior in college, about half a hear before I began my graduate degree program. Although it wasn’t a lot (I had just enough to buy into Vanguard’s STAR fund with the minimum amount), I am glad that I started when I did. I think I gained more know how than dividends and growth from the fund, but of course knowledge pays dividends too. That is amazing that you opened your retirement account so early! Great job! I really like “challenging is different than impossible.” This kind of saving was a high priority for us so we made it happen, though we had to make sacrifices elsewhere. We found a way to make it possible. That is a great idea to experiment with frugal tactics. They don’t all have to ‘stick’ but if a few do you will really benefit!